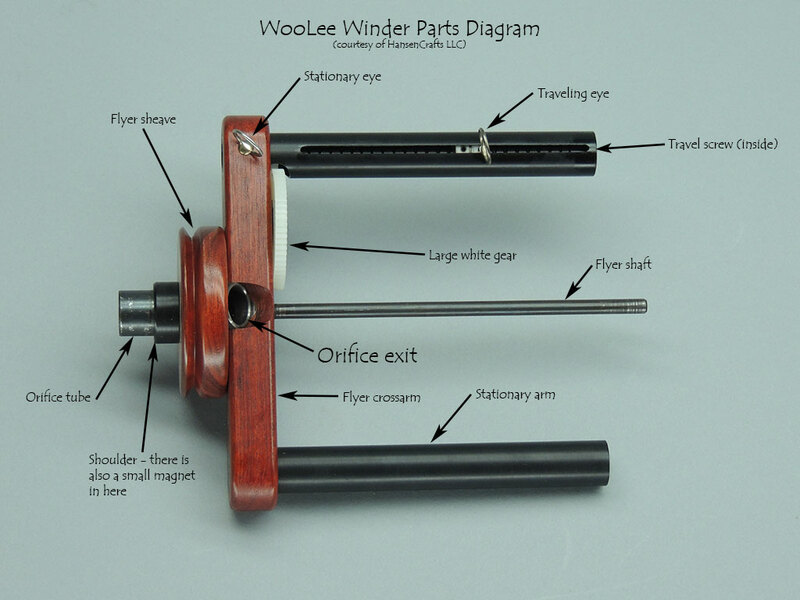 WooLee Winders are our #1 technical support issue; most problems are due to a lack of maintenance. miniSpinner Owner: "I love my miniSpinner, but.. it keeps stopping." miniSpinner Owner: (Long pause, embarrassed giggle.) "Oh! Um, I've never cleaned it!" I can't tell you how many times we've had this conversation. WooLee Winders, like any other mechanical thingy, need to be cleaned and serviced periodically to keep them working well. Erratic takeup is usually caused by sticky/dirty areas on the travel screw or a buildup of fuzz at one end of the travel screw inside the flyer arm where you can't see it. To compensate for the lack of takeup at the sticky spots, you must increase the brake tension to overcome the friction, but when your WW gets past the sticky spot it will pull like crazy because of excessive brake tension. Cleaning and lubricating your WW will improve things dramatically. If your miniSpinner stops unexpectedly, it's usually caused by using excessive brake tension. If your WW is really dirty, it will require considerable brake tension to overcome the friction from dirt, fuzz, congealed oil, and so on. You will eventually find you have to increase the brake tension to the point that it trips your miniSpinner's overload protection (so you don't burn out the motor) and your miniSpinner will stop to let you know something's not right. That's when we get The Phone Call. Does my WooLee Winder need cleaning? You can easily tell if your WW needs cleaning with this simple test. Use a gentle touch of your finger to slowly turn the large white gear to actuate the level-wind mechanism. Continue to gently turn the large white gear, feeling for resistance, until you've moved the traveling eye throughout its entire range of travel. If you feel the mechanism stick - even slightly - or become more difficult to operate anywhere, your WW needs to be disassembled and cleaned because the travel screw probably looks like the picture below. Yuk! 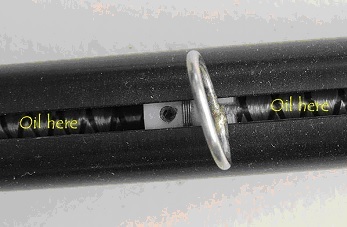 Note the fuzz wrapped around the travel screw at the left end near the small gear, and beside the traveler towards the other end. I wonder why it doesn't work very well? The more freely it operates, the better it works and the more you'll enjoy your WooLee Winder. Also apply a film of Super Lube Synthetic Grease to the outside of the orifice tube where it goes into the miniSpinner's ball bearing. If your bobbin rattles, put a blob of Super Lube Grease on the flyer shaft before you install the bobbin. **Super Lube products are available from HansenCrafts. WW cleaning instructions came with your WW, or obtain them from the WooLee Winder Company. Just do it, you'll be glad you did!